Seeking funds for water projects | Infonet Biovision Home. Project proposals are documents requesting for financial assistance to convert a bright idea into a development project. Project proposals are presented to NGOs and other donors for funding or implementation. Since development agencies usually have highly qualified and experienced staff to evaluate project proposals, these must be written in a clear, short and comprehensive style. Keep in mind that project proposals are actually sales documents trying to convince a donor to finance a project. Project proposals must therefore be written convincingly but without overstatements. Also avoid technical jargon, complicated words and long sentences. Front page should have state that it is a Project Proposal for the name of a project, e.g. Ukambani Rural Water Project, at the top of the page. In the middle of the front page a photo with an explainable caption illustrating the main component of the proposal should be placed to give the readers a quick view of the proposal that may give them interest to read the proposal. The name, postal address, telephone numbers, email addresses and logo of the company or organization that is presenting the proposal are placed at the bottom of the front page. A summary should be at the top of the second page of a project proposal and cover about half of the page. Summaries should explain in clear and informative text the background and need for the proposed project with references to past meetings on the subject, if any. The benefits and possible disadvantages to the community and to the environment of the proposed project must be explained clearly. Such as in this example, where 200 water projects can supply up to 190,000 cubic metres of water from two rainy seasons annually. The projects can be constructed by some trained 100 communities for a grant of US$ 947,400, which gives a construction cost of US$ 9.97 per cubic metre (1,000 litres) of water. The cost of operation and maintenance of these 200 water projects involves only a few trained community builders, which the communities can finance themselves from charging a fee for water drawn. Experience and references from implementation of similar projects should be mentioned with references. Table of contents of the proposal, inclusive annexes, are listed with their respective page numbers on the third page of proposals. Justifaction of the proposed project should then be explained on the next pages. Describe briefly the inhabitants' constraints with their water supply for domestic use, livestock and farming. Insert a map of the project area and photos of their water supplies. Give clear information on the number of inhabitants, number and types of livestock and land use by means of simple graphs, tables, flow charts, etc. Technical solutions to the constraints mentioned above are thereafter described with photos, sketches and a brief technical text with reference to the relevant annexes with technical details. A Survey and Design Report with technical drawings and estimates on yield of water and costs should be attached as an annex, if available. The 1st workshop should discuss and agree on the Survey and Design Report with the community. Should such a report not be available, it can be made during the 2nd workshop. The Implementation Agreement stating the donor's conditions for giving financial assistance to cost-sharing with the community on training and construction works is explained and signed. A work plan can be formulated when all these subjects have been agreed upon and the Implementation Agreement has been signed by the project committee and the donors representative. Such a training course takes about 5 days to implement provided the venue is situated so far away from the members homestead that they cannot have any excuses for being absent from the training. The 2nd workshop consist of training a group of community members in identifying suitable sites for construction of water projects which in this example have been decided to consist of 50 hand dug wells upstream of subsurface dams in dry riverbeds and 50 hand dug wells downstream of small earth dams along public roads.The workshop should begin with a study tour to another region where these types of structures have been constructed and are functioning successful.Thereafter the workshop members will point out similar places for their water projects on a contour map, preferably 1:50,000, of their project area and decide on a tour schedule. GPS (Global Position System) readings, photos and observations at each of the evaluated sites are documented in a Survey Report. The 3rd workshop should take place when the technical drawings and bills of quantities (BQs) of the water projects have been produced and approved by the authorities.The drawings and BQs are explained to the participants who will arrange for their deliveries of the required soil, sand, crushed stones, stones, water, store and accommodation as agreed upon in the Implementation Agreement (click to Survey, design, etc. ), which has now been adjusted to the final design drawings. The 4th workshop is a 2 months training of 24 local builders who will be building the structures while learning to be self-employed contractors. The 5th workshop should deal with training the committee members in financial management of their water project just before the construction work is completed. The training curriculum should deal with; operation and maintenance of the project, record keeping of income and expenditure, running costs of the project, budgeting for unforeseen expenditures, salaries and allowances for staff and committee members. The financial outcomes of these subjects are used for calculating the water tariff. Bank procedures are explained and the By-law is adjusted to operation and maintenance. 50 hand dug wells for all types of water consumption will be sunk into the shallow ground water identified in the riverbanks of ephemeral (seasonal) water courses, also called dry riverbeds, sand rivers, luggas and wadis. A well sunk at the deepest point in a 20 metre wide riverbed, as in Mwiwe, yields 139,000 litres of water which amounts to about 772 litres per day in a dry season of 180 days without recharge from upstream or floods. 50 wells will thus supply about 7,000 cubic metre of water twice annually. 50 subsurface dams will be built of soil from onto natural underground dykes to 30 cm below the surface of sand in riverbeds, increase their yield of water. A subsurface dam built of soil built in a 20 metre wide riverbed can increase the yield of water from a well from 139,000 litres to 1,141,000 litres, which is 6,339 litres of water per day in a dry season of 180 days without recharge from upstream or floods. 50 subsurface dams will thus supply 57,000 cubic metres of water twice annually. 50 small circular charco earth dams or semi-circular hillside earth dams to provide water for livestock and garden irrigation will be built manually and with farm implements along public roads to harvest rainwater run-off from these roads. On average a community can construct an earth dam with a storage volume of 600,000 litres during 300 working days (2 cubic metre/person/day) in a dry season. However, due to evaporation and seepage only about half the volume, 300,000 litres will be available that is 1,667 litres of water per day without any rains in 180 days. 50 earth dams should therefore supply 30,000 cubic metres of water twice annually. 50 hand dug wells will be sunk into seepage lines downstream of the 50 earth dams to provide water cleaned by the seepage for domestic use. Since about 150,000 litres of water is lost to seepage a quarter of it, 37,500 litres, may be extracted from a well which is 208 litres per days in a 180 days period without rains. 50 wells should therefore supply 1,875 cubic metres of water twice annually. Summarized, these 200 water projects are expected to supply about 190,000 cubic metres of water from two annual rainy seasons in a year. Communities cannot be expected to provide free labour during rainy seasons when they are busy in their fields. Hand dug wells should be deepened when the shallow ground water level is at its deepest which is towards the end of dry seasons. However, the upper part of the well shaft and the well head can be constructed anytime of the year provided the shaft is made to sink through the apron. Subsurface dams should not be constructed in rainy periods when flood water can destroy the construction works. Earth dams built manually are very labour intensive and should therefore only be constructed when communities are not busy in their fields which are a few months before rainy seasons. Concept papers are proposals which NGOs have compiled to short and comprehensive documents to be presented to bilateral donors (e.g. Danida and Sida) and multilateral donors (e.g. UN agencies) for financial support. NGOs compile their concept papers on basis of either their own proposals or proposals which they may have received from community groups, women groups, etc. Often a positive evaluation report on an existing development project is used to produce a project proposal, which may thereafter be used as a basis for formulating a concept paper to be presented to a donor for funding of that project proposal. The cost of producing concept papers and project proposals cannot be reimbursed. The financial viability of producing these documents can only be found if financial support is secured for the proposed project and a reasonable fee for administration of the project is agreed upon. Although there is no fixed administration fee for implementation of projects, it is understood that a norrmal fee amounts to about 17% of the total implementation cost, inclusive procurement of transport, equipment and materials as well as emoluments of project staff and consultants. 1. Background and need for the proposed project. Describes where the project area, its inhabitants, their livelihood, constraints and potential. 2. Background and experience of the NGO to implement the proposed project. 3. Describes the NGOs organization, its objectives, its capacities and experience. Description of the proposed project, communities, input and output, etc.Describes the community activities and cost-sharing, coordination with local authorities, training of local staff, expected outputs and sustainability after completion of the project. 5. Implementation schedule. Describes local and external staff as well as requirements of housing, transport, offices and equipment. 7. 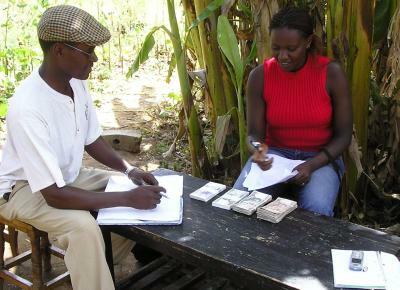 Monitoring and evaluation. Describes who and when the internal and external monitoring and evaluation shall take place. 8. Assumption and risks. Describes what the project is assumed to benefit from and what could go wrong if these assumptions fail to mature. 50 of the proposed 100 hand dug wells for domestic water shall be sunk in riverbanks where investigations have identified natural depression in riverbeds where flood water is stored in the voids between the sand particles. The proposed 50 subsurface dams shall be built manually of clayey soil onto natural underground dykes identified downstream of the wells for the purpose of raising the water level and increase the yield of water in the wells. The proposed 50 earth dams shall be built manually combined with animal draught in depressions and valleys along public roads which will function as catchment of rainwater for the dams. The other 50 of the proposed hand dug wells shall be sunk into seepage lines downstream of the earth dams. The wells will provide clean water for domestic water while water in the dams will be used for watering livestock and irrigating small vegetable plots. The investigation methods for identifying suitable sites for hand dug wells and subsurface dams in riverbeds shall be in accordance with the instructions given in a handbook Water from Dry Riverbeds. Site identifications of sites for earth dams and well along road shall follow another two handbooks Water from Roads and Water from Small Dams. Present an implementation schedule with the upper horizontal line of the graph listing the annual quarters or months of the implementation period, while the activities are listed vertically on the left side of the graph. The implementation periods of the activities are marked in the respective squares as shown below. A Logistic Framework shows how to verify progress on agreed objectives based on the assumption of some factors. Logistical frameworks give a comprehensive and quick overview of progress, or lack of it, by project managements, consultants and donors. Budget must reflect the exact cost of the various components listed in the Concept Paper and attached Project Proposal. Failure to miscalculation, roughly estimates or forgetting some of the expenditures will usually result in severe budget constraints which most donors will not appreciate.